Double Cutaway Set Neck Carved Top Flamed maple Kit COMPLETE! Home > Guitar And Bass Kits > Double Cutaway Set Neck Carved Top Flamed maple Kit COMPLETE! A SUPER NICE double cutaway kit- SOLID mahogany body- SOLID Mahogany Neck- Super flamey maple veneer on the carved top- cool cutaways for knobs and switch that reveal some mahogany end-grain. Super nice Rosewood fingerboard with "Tomoe" inlays I think this is one hell of a package. The body is bound- and that super flamey top is ready for some aniline dye or stain. 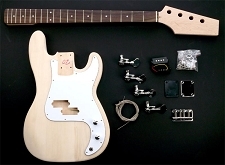 A Super way to get introduced to the art and craft of building your own guitar. These are factory fresh and first quality- NO SEALER is applied- These are raw wood so you can choose to apply a vintage Lacquer finish if you choose. This is a SET NECK guitar- You glue the neck to the body. Take your time- do some homework, get the right glues and finishing materials and you can craft a very, very nice playing instrument. 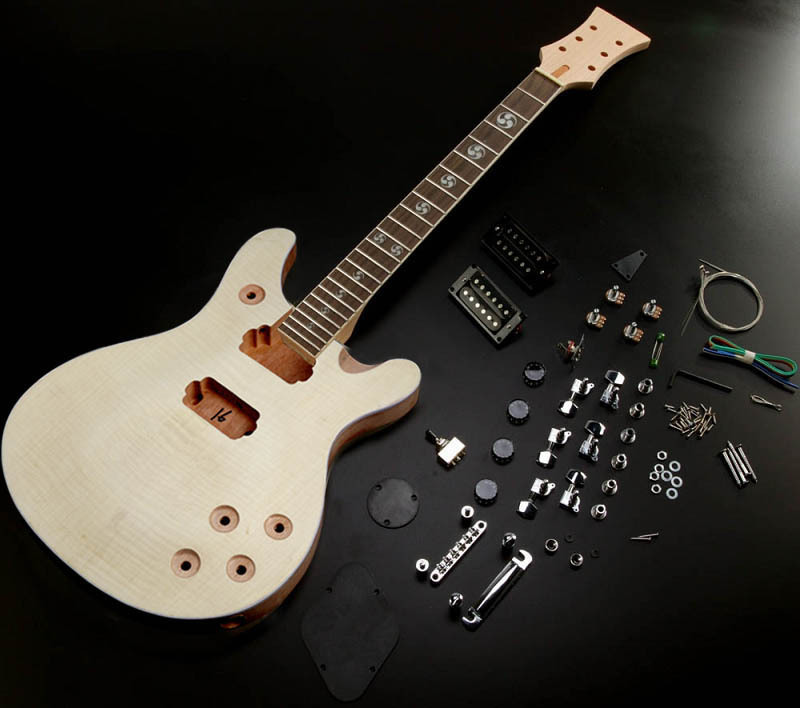 We include all the basics- and of course we strongly encourage you to think about upgrading pickups and parts with our reasonably priced line of stuff available right here on this very website! 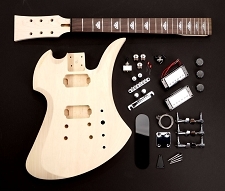 NOTE: The neck no longer has the Tomoe Inlays in this kit. We are updating the photo shortly. Vintage "Explorer" style kit- Poplar Body- COMPLETE! 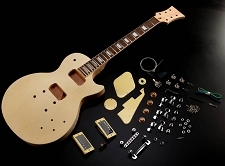 Classic "Mockingbird" Style guitar Kit RW- Poplar body- COMPLETE! 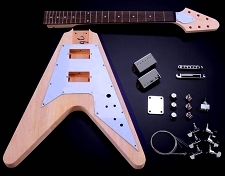 Vintage "Explorer" style kit- Poplar Body- COMPLETE! "For Paint Only"